Does it ever strike you how much more vivid some memories are than others? I have been thinking about this lately. I remember several of my birthdays of my 40 birthdays much more specifically than others. This week Lucy and I went to Panera and as we pulled into the parking lot, we drove past the movie theater. She said, “There’s the movie theater!” I said, “Yes!” Then she said, “My ear was hurting really badly there one time!” And I thought for a minute, and remembered that last summer when we went to a movie, my then 3-year-old had a really bad earache that came on during the movie. We had to take her out during the movie because she was just miserable. So now she associates the theater with the earache. The older we grow the more we have to remember, and at some point we realize that most, if not all, of what we have is memory. Our memory plays a central role in our sense of being. Our pains and joys, our feelings of grief and satisfaction, are not simply dependent on the events of our lives, but also, and even more so, on the ways we remember these events. The events of our lives are probably less important than the form they take in the totality of our story. Different people remember a similar illness, accident, success, or surprise in very different ways, and much of their sense of self derives less from what happened than from how they remember what happened, how they have placed the past events into their own personal history. It is not surprising, therefore, that most of our human emotions are closely related to our memory. Remorse is a biting memory, guilt is an accusing memory, gratitude is a joyful memory, and all such emotions are deeply influenced by the way we have integrated past events into our way of being in the world. In fact, we perceive our world with our memories. Our memories help us to see and understand new impressions and give them a place in our richly varied life experiences. So, I have this food memory. I mean, I have a lot of them. Don’t you? 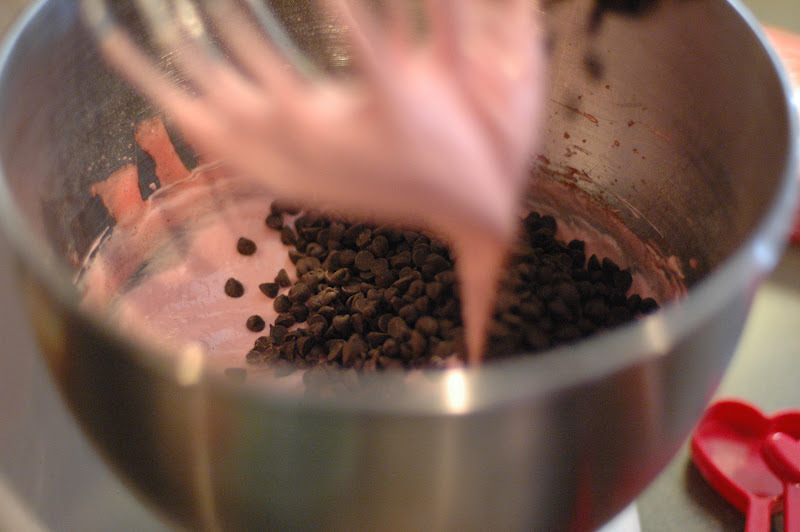 I have this memory of pink, fluffy, crunchy pillows of raspberry meringue dotted with chocolate chips inside. 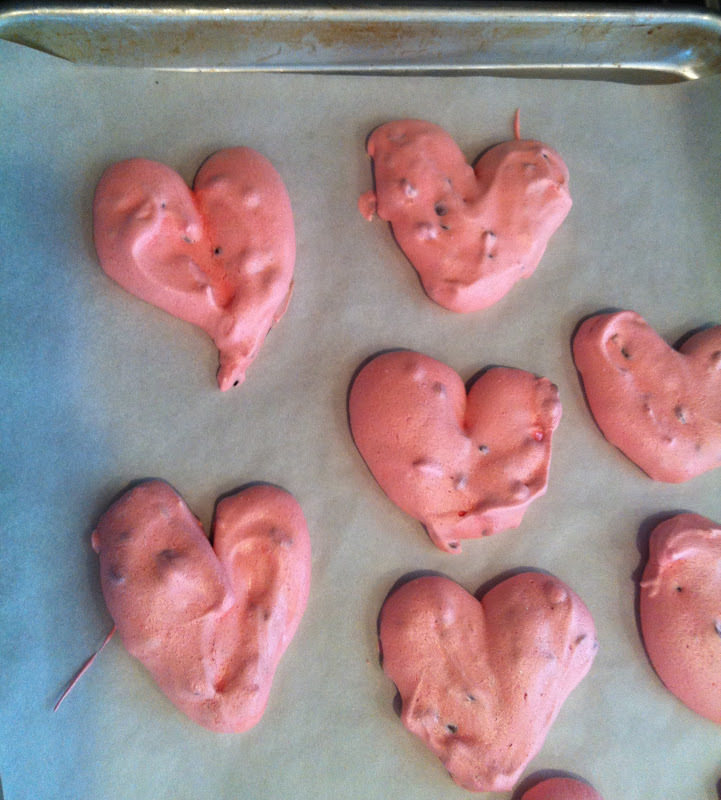 These meringue cookies were soley connected to my first piano teacher. They are lovely. I don’t have great memories of lessons. It was actually a painful and difficult experience from which I have very few vivid memories. I think the majority I mercifully forgot. I wasn’t great at practicing and I wasn’t great at criticism. I have memories of the afternoon sun on my back in the stuffy backroom where the lessons took place. I remember her perpetual disappointment in me. And juxtapositioned with these difficult memories, I remember these delightful cookies of hers. She made these as her signature cookie for her student recitals she had each season. I remember loving them. I remember getting the recipe from her for them. I remember making them at home with my mom and sister. I remember that they required brown paper bags torn to line the baking sheets. I remember that you turn off the oven and cool them in the oven. (It dawned on me the other day when I was preparing to make them that 30 years ago torn apart grocery sacks WERE the parchment paper of the day. I’m glad I caught myself before I went to the trouble of tearing apart paper sacks). 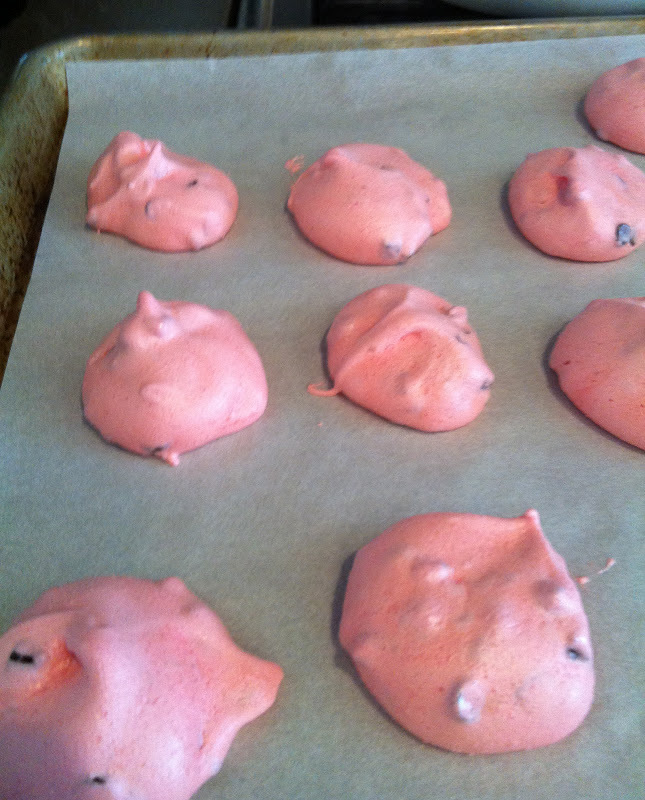 I hadn’t had a raspberry meringue cookie for a decade, or maybe even two until a couple of weeks ago. At a cookie swap in December, my friend Rebecca made peppermint meringues for the swap and I loved them and it made me think about these piano teacher pink lovelies. And then I saw a photo online of some that looked like the ones. I wanted to make them for Valentine’s but I ended up making them after. They were just like I remembered. And my kids loved them. Asher especially. He couldn’t get enough. We had friends over and everyone was scarfing them down. We decided to make another batch the next day. So, I imagine that I will now be making these more frequently. Thankfully, my children had a happy, pure first experience with these cookies. The beauty of redemption is powerful, even through baked goods. Beat egg whites with salt. Add gelatin and sugar gradually. 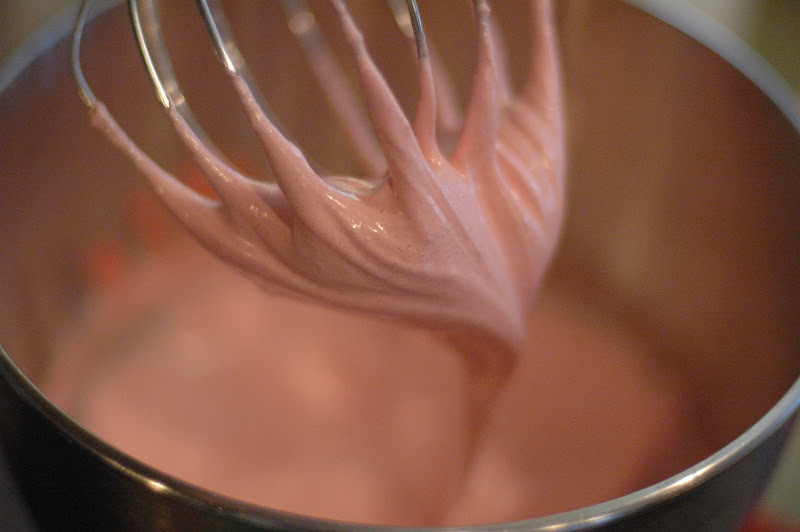 Beat until soft peaks form and sugar is dissolved. 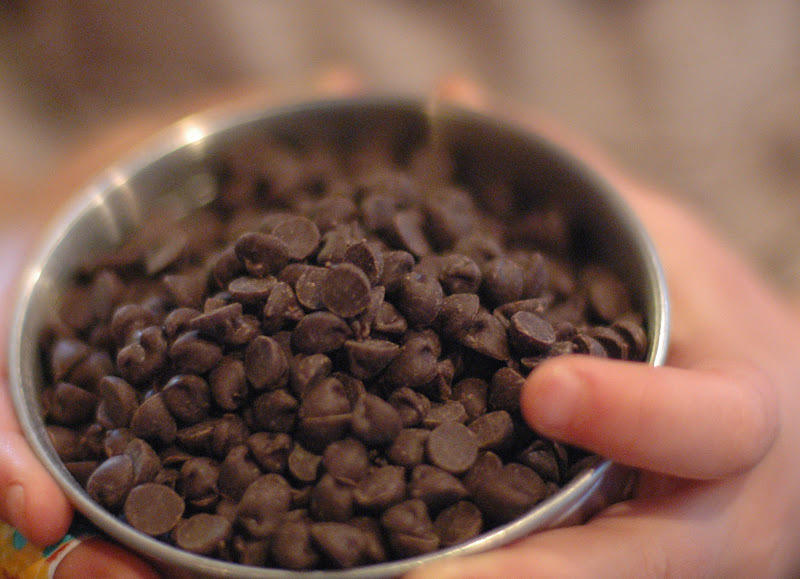 Drop by spoonful onto parchment lined (or brown paper lined) baking sheets. Bake 25 minutes. Turn oven off and leave the cookies in the oven 20 minutes longer. The wonder of these cookies, is that you whip some egg whites and a few other ingredients, and drop it by the spoonful onto baking sheets. 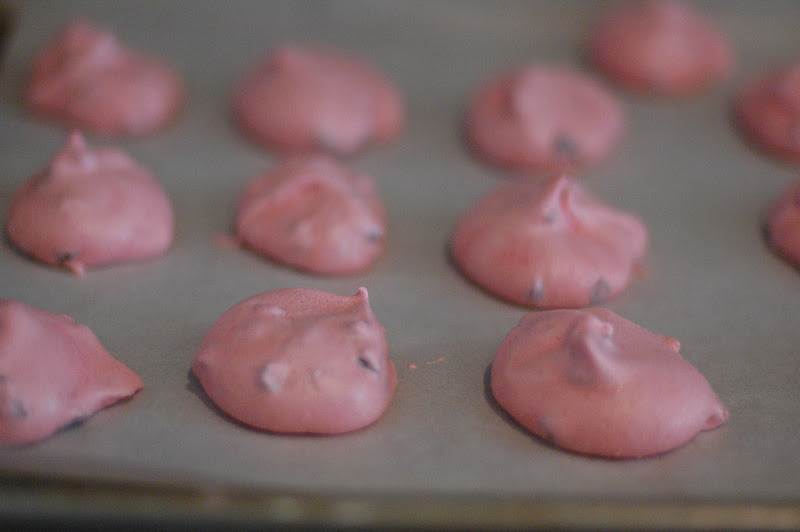 Minutes later, crunchy, airy, meringue cookies appear! These would be lovely for a baby girl shower, or a birthday party, or Valentine’s or spring, or when you are trying to be low-fat (since there is no butter, oil or egg yolks). These are so yummy! I couldn't stop thinking about them after tasting testing, so I made them and the recipe makes a lot! Bonus! I piped some of them and they turned out really pretty with peaks. 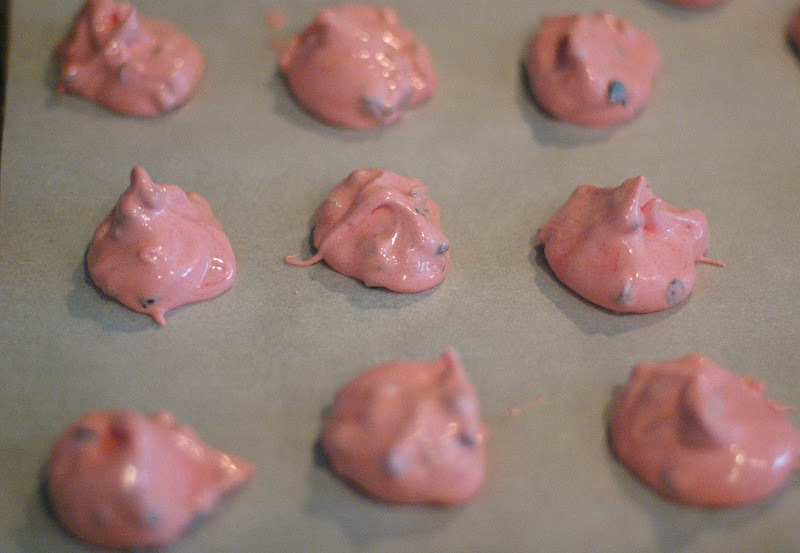 I've always been scared to make meringue cookies, but they're easier than I thought and I love that they only require a few ingredients. Thanks, Julie!